This is the ultimate set-and-forget solution. Never have to move your logger again. Never have to plug it into a computer to read the data. 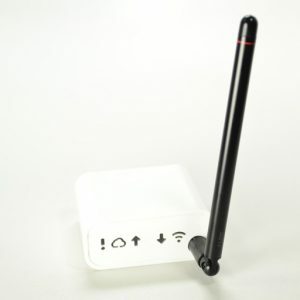 The logger stays in the one place and transmits the data wirelessly. The monitor tile is just 4cm square and less than 1cm thick so it can be placed anywhere you need it - for instance, in a fridge or coolroom. And once you've placed it, you never have to move it - its data is automatically transmitted to the base station. The tiles use a replaceable battery that lasts up to 18 months. Connect the base station to the Internet using an Ethernet cable). The base station will pick up the data transmitted by the monitor tile and upload it to a dedicated server on the Internet. Each base station can collect data from up to 20 monitor tiles as far as 100m away (in ideal circumstances). 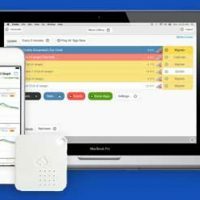 Read your temperature data on any Internet connected smartphone, anywhere. 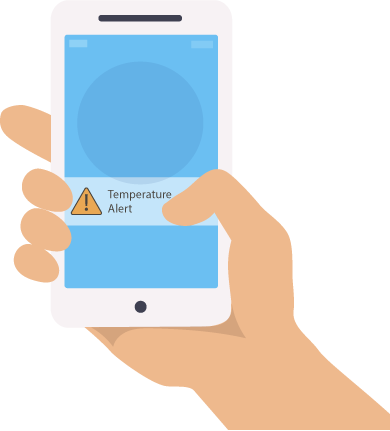 Get alerts on out-of-range temperatures, connection outages and more. Check current temperatures without leaving your desk. Easily export data for accreditation reports. 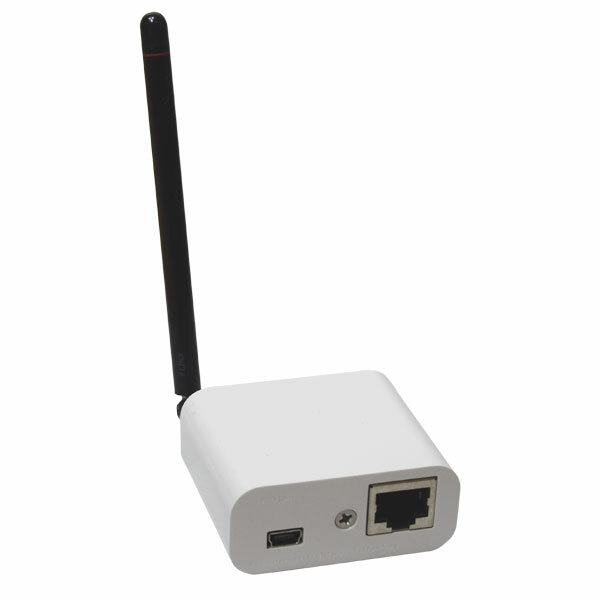 The Wireless Ethernet Base easily plugs into your existing network. 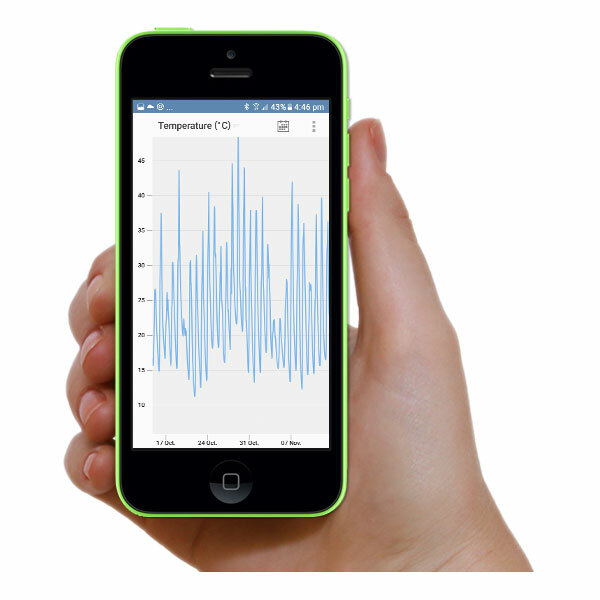 Get our free iOS and Android apps to monitor temperature on the go. Automated recording of temperature and humidity when connected to the cloud server. If you are still checking temperatures manually, find out how our latest wireless temperature loggers can make your life easier. 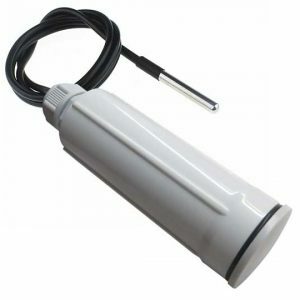 Wirelessly monitor temperature with a stainless-steel 3cm external temperature probe on a 1m cable. 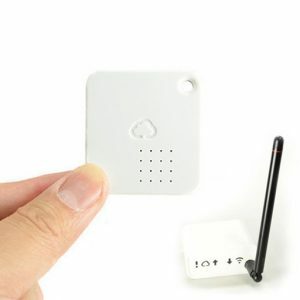 Get started quickly with the Wireless Temperature Logger Starter Kit. Includes a temperature logger and Ethernet Base Station. What's the difference between a Sensor and a Logger? You’ll notice there are two different types of tile: sensors and loggers. They look identical and both measure the temperature and transmit the data to the base station. The difference is that the Sensor has no internal memory. This means that if the power goes out and the base station is down, no data will be recorded. The Logger, on the other hand, has an internal memory. It will continue to record data while the power is out, and when the base station comes back online, the data will be transmitted to the server with no gaps. Which do you need? That’s up to you. If a complete and uninterrupted record of temperature is needed, you will want to go with the Logger. 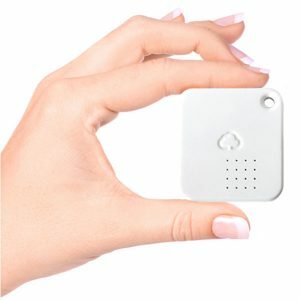 If you just need alerts about temperatures and power issues, the Sensor is probably all you need. Range 700ft (210m) line of sight, 5ft from ground, default setting. Indicator lights Error light. Flashes when trying to configure itself to connect to the Internet (when acquiring IP address through DHCP). Rapidly flashes when trying to connect to web service. What is the wireless temperature logger? 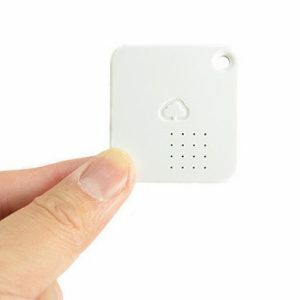 The wireless temperature logger monitors the temperature and transmits these readings back to an Ethernet base station which then uploads this data to the cloud based server. 1. It provides a fully automated audit trail and significantly reduces labour costs as well as reducing the chance of human error. 2. 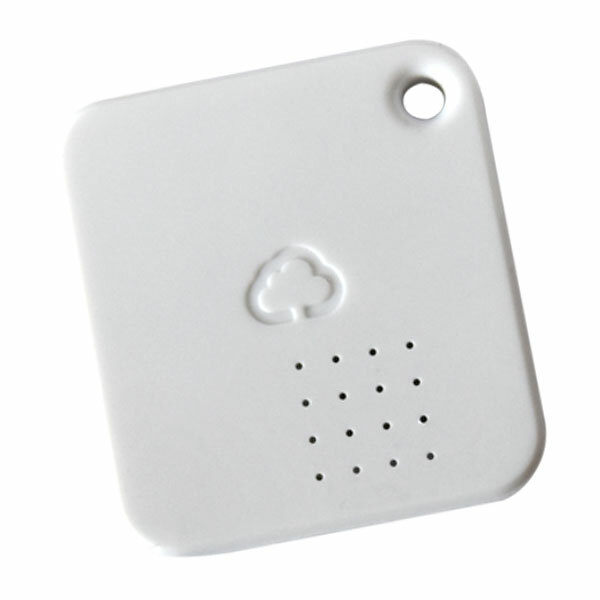 It provides immediate alarm notification if a location becomes too hot or cold. These notifications are sent to smart phones (free app) and email addresses. Each point to be monitored (e.g. fridge, freezer, incubator, room) requires a wireless temperature logger. At least one Ethernet base station is also required. What are the specifications for the wireless communications? The unit uses the 433MHz range. The exact frequency can be modified but typically does not need to be adjusted. This is a public frequency and is used by other devices such as portable phones and door bells. The loggers will communicate up to 200m “line of sight”. In reality it will communicate up to about 2 rooms away, or across a warehouse. Doors and walls reduce the range. How does the Ethernet base communicate with the cloud? The Ethernet base station uses 10Base-T and uses two ports to communicate with the cloud server. Port 80 (HTTP) and 6667 are required for external communication. DHCP is used to acquire the IP address. At the time of writing the server addresses were 23.253.41.230 (wirelesstag.net) and 104.130.203.171. The Ethernet base station has minimal processing capacity and mainly relays information to and from the cloud server to the loggers. There is no configuration within the device required or possible. How much bandwidth will they use? Bandwidth is minimal. Periodic updates of the temperature are very small in size and only occur every couple of minutes. Can the MAC address be provided prior to installation? No. This is an Ethernet only product. We use products like the Netgear AC750 Wi-Fi range extender to create an Ethernet port if there is only Wi-Fi is available. Is there an operating system? No. The Ethernet tag manager is not based on an operating system or open source code. It does not have the security risks relating to them. What do the base station’s LEDs mean?